3. 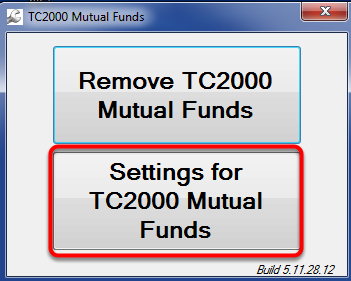 Select Settings for TC2000 Mutual Funds. 6. 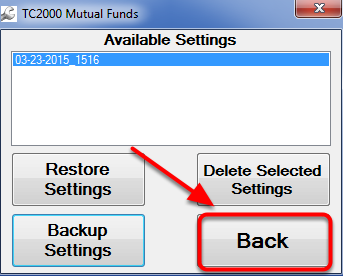 Click the Back Button in the Funds-Remover Window. 7. 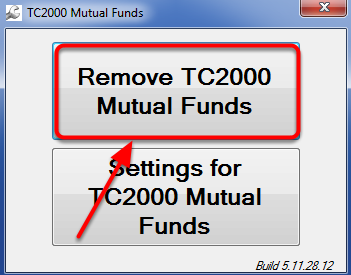 Click Remove TC2000 Mutual Funds. 8. Click Yes to confirm removal. 9. Click OK in the Removal Complete Window. 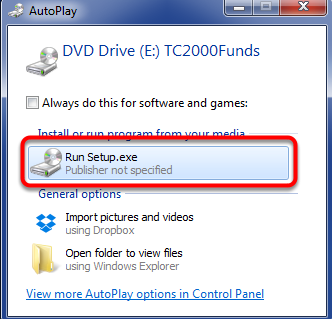 In the AutoPlay window click Run Setup.exe. 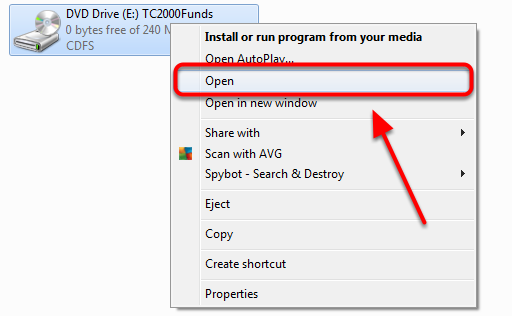 If the AutoPlay window does not appear click on the Windows Start button and then on the option that pertains to your version of Windows below. Windows XP - "My Computer"
Windows Vista or 7 - "Computer"
Windows 8/8.1 - "This PC"
11. Click Next in the Welcome Window. 12. 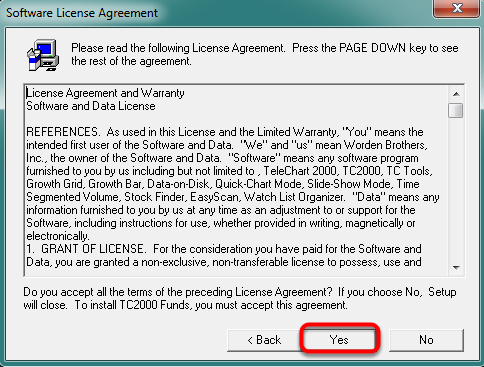 Click Yes to Agree to the Software License Agreement. 13. 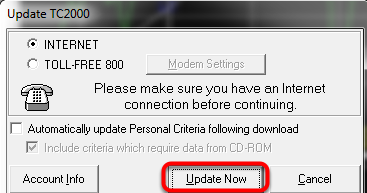 Select the Install path and click Next. 14. 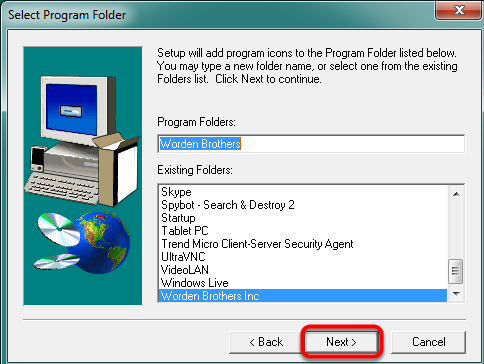 Select Program Folder and click Next. 15. 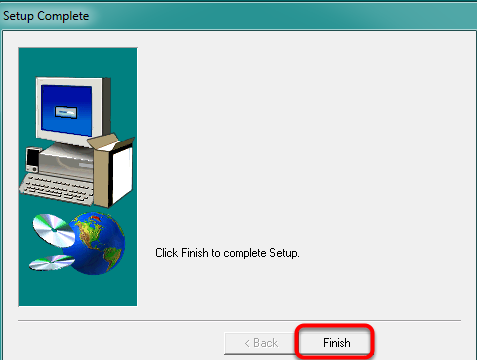 Click Finish to Complete Setup. 16. 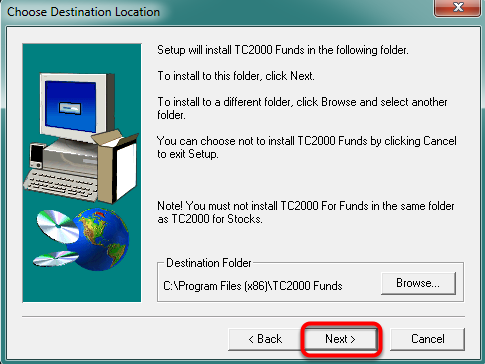 If you running TC2000 Mutual Funds on Vista, 7, 8, or 8.1 follow the steps in the below link to Set TC2000 Funds to Run as Administrator. 17. 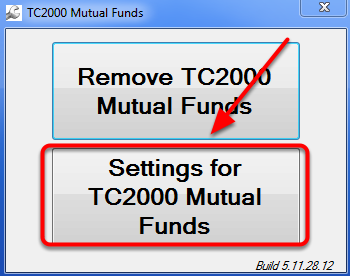 Double click the TC2000 Funds Icon on your desktop to launch TC2000 Mutual Funds. 18. 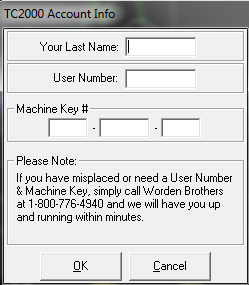 Enter your Last Name, User Number, and Machine Key numbers and then click OK.
19. Click Update Now to download the latest Price Data. 20. 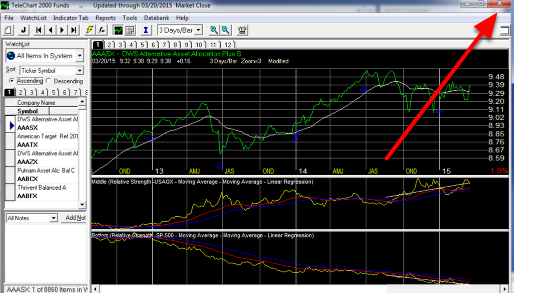 Close TC2000 Mutual Funds. 21. 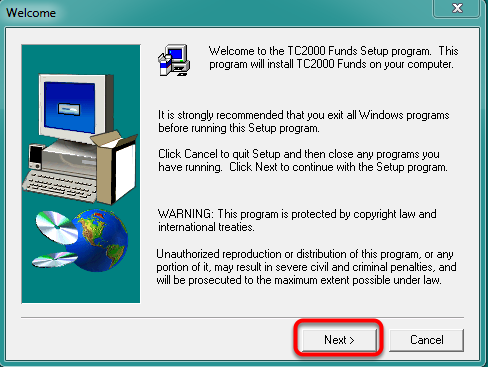 Run Funds-Remover.exe again, if prompted allow it to make changes to your computer. 22. 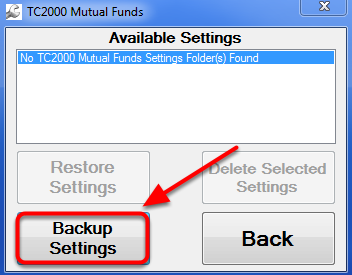 Click Settings for TC2000 Mutual Funds. 23. 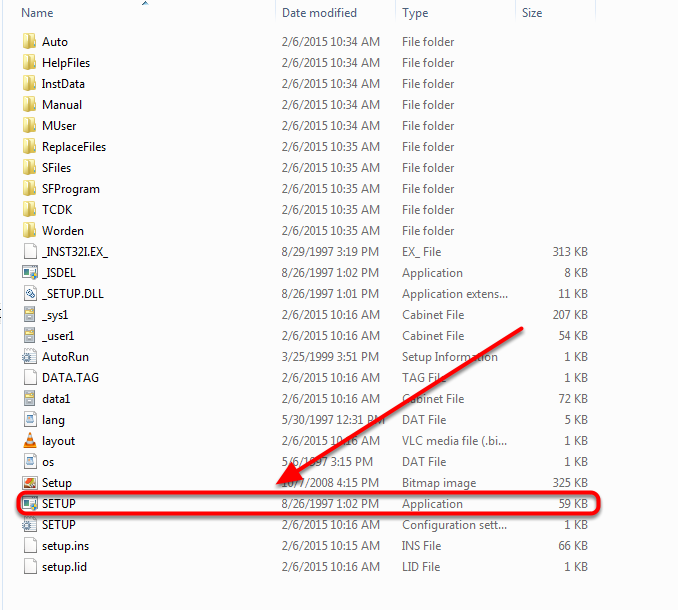 Select the file named by the most recent date and then click Restore Settings. 24. Click Yes to Confirm Restore of Settings. 25. 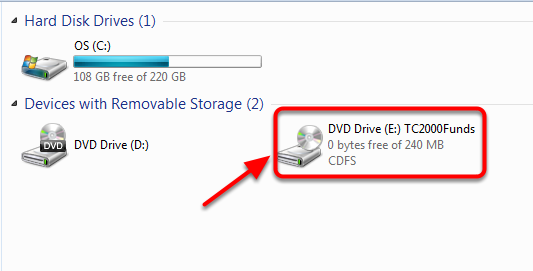 Click OK in Restore Complete window. 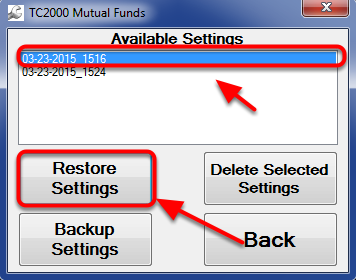 Your TC2000 Mutual Funds settings should now be restored.